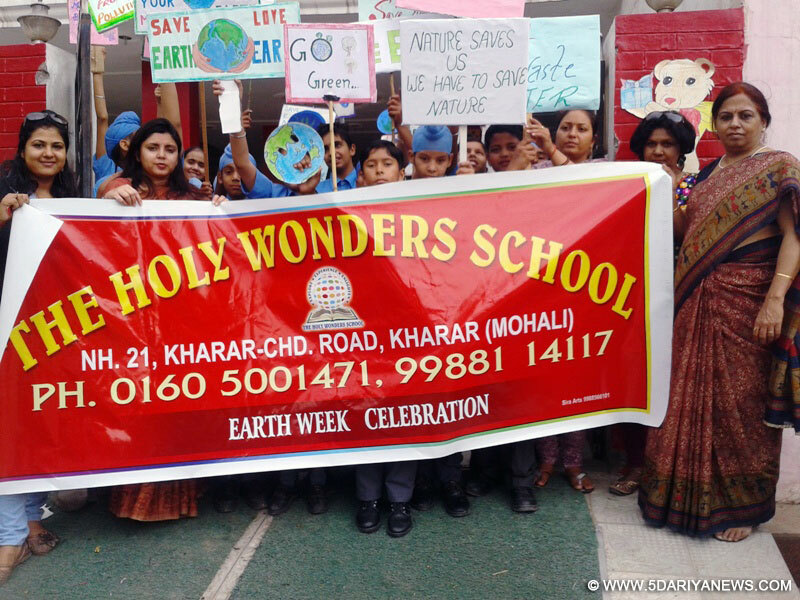 The Holy Wonders School, Kharar observed EARTH WEEK from 22-04-13 to 27-04-13 . All the students were sensitized about the need to save mother earth through various activities. They were acquainted with the imminent peril to Mother Earth due to modern day activities of Human beings & Global Warming and how we can save our beautiful mother Earth and make it a better place to live .Various activities were organized for different classes like making Placards bearing slogans to save Mother Earth ,making charts , making masks, making Bookmarks bearing the Earth day Theme, drawing and colouring Earth. On 26-04-13, all the students of classes 3rd to 7th went enthusiastically for a road show at Kharar Market and adjoining areas carrying placards and saying slogans to save mother earth and spread awareness among the people to save the environment and our heavenly Earth. The Earth WEEK concluded with a quiz on EARTH and ENVIRONMENT as an activity to assess the understanding of the students about the sensitive issue of Global Warming.